You may recall that we love handwriting activities around here. 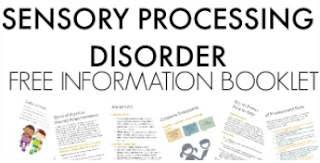 It's a topic I've loved to cover since my days as a school-based Occupational Therapist. I love to take an activity that works on the skills needed for functional tasks and build them through creative play and development. It's just fun to be creative! 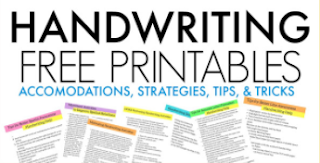 There are a ton of creative ways to build handwriting skills here. 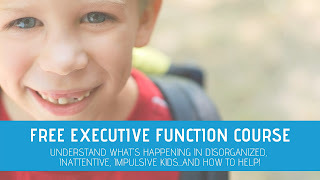 But sometimes, all it takes to improve letter formation, line awareness, spatial skills, and overall legibility is practicing using the skills that have been built and developed through therapeutic activities. 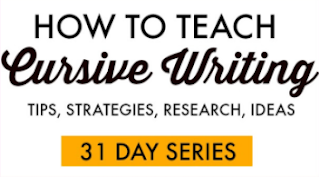 Today's post is a creative and fun way to sneak in practice on a daily basis. We made this handwriting clipboard to work on written work with an alphabet theme. It's one of the activities that we found in the (affiliate link) 101 Fun and Easy Learning Games for Kids book that two fellow bloggers have recently published. Read more about that here. Kids sometimes need a little motivation to practice and work on their handwriting. A fun activity like this A-Z writing sheet can help. 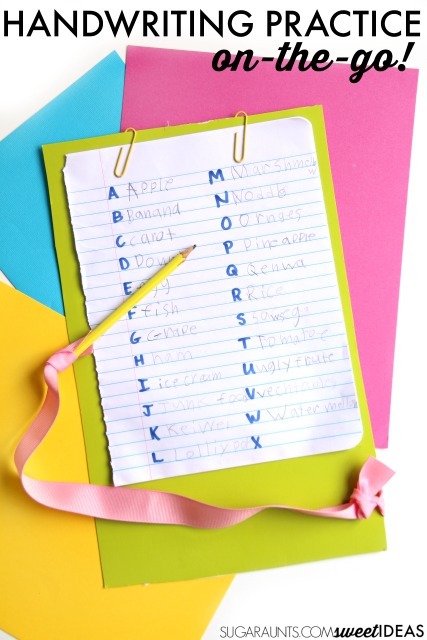 Simply ask kids to write out a word for each letter of the alphabet, based on a single topic. You might walk through a grocery store together while completing the week's shopping as your child writes out words of foods that he sees in the store. You could take a walk in the park and come up with a list of A-Z words based on things you see and hear around you. The possibilities are endless for this handwriting prompt. We decided that if we were to walk through a store and write out a list of items, we would need a clipboard or some kind of stable surface for writing. From there, came our DIY cardboard clipboard! Make up one of these clipboards on the cheap and have a writing surface for all of your portable handwriting practice sessions. To make the cardboard clipboard: Cut the cardboard to the appropriate size. Slice a hole and thread ribbon into the cardboard. 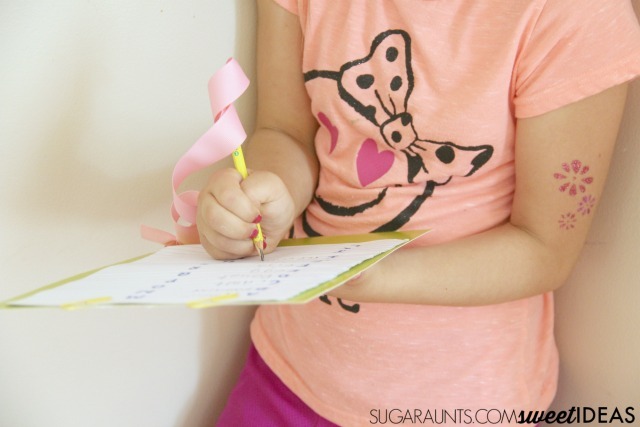 You'll want the ribbon to be long enough for comfortable writing. Knot the ribbon. Tie the other end of the ribbon to a pencil. Attatch paper to the clipboard using paperclips. Your cardboard clipboard is done! Want MORE sneaky (and totally fun!) ways to incorporate handwriting into play and activities while making handwriting practice not-boring? Try our Sensory Handwriting Summer Camp. 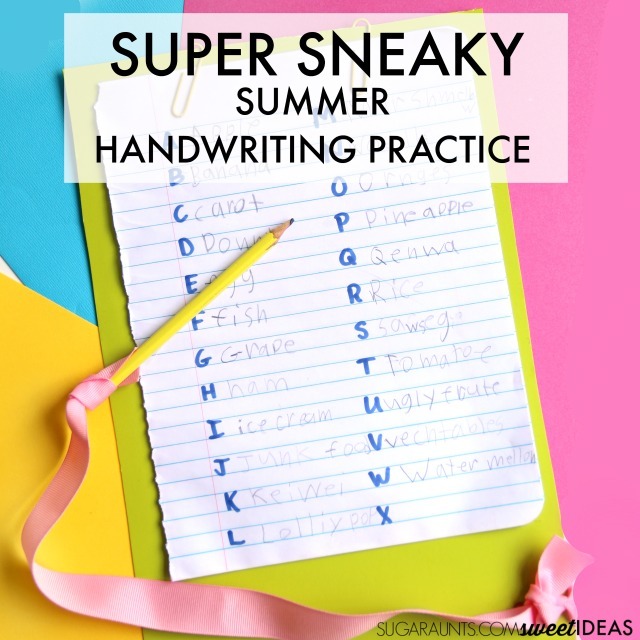 It's packed with a summer full of handwriting fun. What A-Z writing prompt lists can you think of? Want to find more creative ways to learn through play and games? Grab your copy of 101 Fun and Easy Learning Games for Kids . This book is packed to the brim with creative learning ideas that are complimented with colorful images. You need this book! This activity has been reprinted with permission from the publisher from book 100 FUN & EASY LEARNING GAMES FOR KIDS. I received a copy of the book from the publisher.